When a young girl is abducted by a notorious serial killer, a woman risks her own life trying to save her. Mina is struggling to come to terms with her past. Having led a reclusive life, shunning human contact, she decides to take on a local college course to help get her life back on track. However, when a young girl who tries to befriend her is abducted by a serial killer, Mina feels responsible. She refused to wait with the girl for her mother to pick her up. And she shrugged off the youngster’s fears. Now Mina cannot rest until she finds out what happened. But as she probes into the events of that evening, her own nightmares start to return. She has put herself in danger, one that leads to an increasingly tense standoff with a cruel and vicious man who will stop at nothing. Can she find the strength to stand up to her demons, past and present? And will she do so, even if it means risking everything? 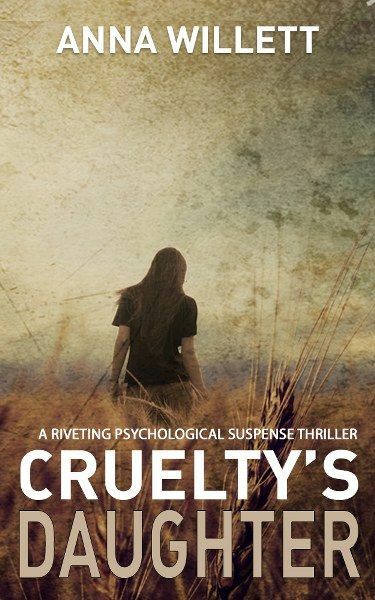 CRUELTY’S DAUGHTER is the fifth novel by best-selling Australian author, Anna Willett. She writes in the thriller genre, with a touch of horror. Her books explore how women react to difficult situations. The books are full of tension, physical and psychological, and they are difficult to put down. The tyres bounced over what felt like a speed bump and Andrea’s head thumped the bed of the van with a cold whack. It was as if the blow had cleared her faltering thoughts and jerked her back to reality. She’d rolled onto her back. Her shoulders straining with the weight of her body. She gave a hoarse grunt and rocked herself into a sitting position. With the sack over her head, it had been impossible to see her surroundings. She could smell petrol and something metallic. Coupled with the stench of the sack and her own urine, she felt as if she’d choke on the mingling odours. I have to get out, was the first coherent thought she’d mustered since he’d grabbed her. Her terrified mind latched on to it. By bending her knees and pushing off with her heels, she managed to shuffle towards what she guessed were the back doors. The slippery tray helped speed her progress and within a minute, her feet were pressed against something solid. Andrea had leaned back and raised her legs, pressing the soles of her shoes against the surface hoping to find glass or something she could kick through. After an exhausting exploration of the rear of the van, she found nothing but a solid mass padded with something spongy. Wrists aching and shoulders burning from being compressed beneath her, Andrea rolled back onto her side and gave in to despair. Time passed slowly. The rocking of the vehicle and the stuffiness of the hood felt like a weight crushing her lungs until it was difficult to draw breath. Her stomach churned as the constant vibrations jostled her body. Andrea pictured her mother arriving at the college parking lot and waiting for her. How long would she sit in the car wondering why her daughter was late? She could see her mother’s face creased with worry, eyes straining over the screen of her phone because she wouldn’t have thought to bring her glasses. Why would she? The college was only a fifteen-minute drive from home. The vehicle had turned, sliding her to the left and then coming to a slow stop. The engine continued to rumble then died. He’ll kill me now. She clamped her eyes shut. I don’t want to die. I don’t want him to hurt me. “I want to go home.” The whispered plea drowned out the thumping of her heart and comforted her. She repeated the words over and over as if they’d shield her from what was to come. The engine grumbled to life and the van rolled forward. Andrea let out a hiccupping breath. For the time being, she was safe. He can’t hurt me while he’s driving. She allowed herself no other thoughts. What would happen when they reached their final destination? Each time the question pushed its way to the front of her mind, she buried it under a blanket of prayers and images of her mum and dad. Outside, sounds of traffic and snatches of conversation had petered into silence as the van left the city and headed into the night. Now, he pushed her forward. She remembered falling and hitting her chin on something sharp. Her jaw ached. His hands, large and rough, grabbed her by the shoulders and pulled her to her feet. 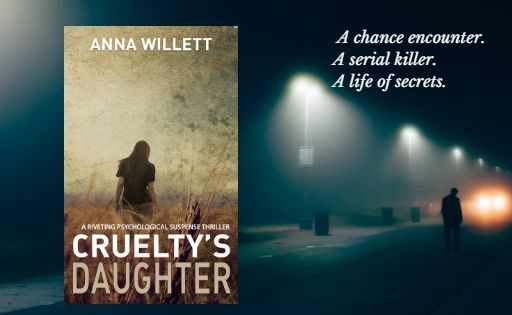 Anna Willett is the author of Backwoods Ripper, Retribution Ridge as well as the bestselling, Unwelcome Guests and the tense new psychological thriller, Forgotten Crimes. Raised in Western Australia, Anna developed a love for fiction at an early age and began writing short stories in high school. Drawn to dark tales, Anna enjoys writing thrillers with strong female characters. When she's not writing, Anna loves reading, travelling and spending time with her husband, children and dogs. Thank you so much for hosting, Cruelty's Daughter. Thanks for all the comments. I really hope you enjoy the book.